If you’ve been shopping from Wildfox for a while, stick around, we have some great news for you! And those of you who are still discovering this vintage knitwear brand founded in Los Angeles, congratulations, you found a new brand you can trust your entire look to. And that’s an important task for us ” women! Despite the name, Wildfox has always offered that cheerful feminine look, which is everything but wild. They’ve been putting forward values like friendship (don’t forget, this brand was established by a duo of best friends), having fun, and being a “soft beauty’ is in the focus of each Wildfox campaign. So, now you can also get the first ever “Wildfox’ fragrance. 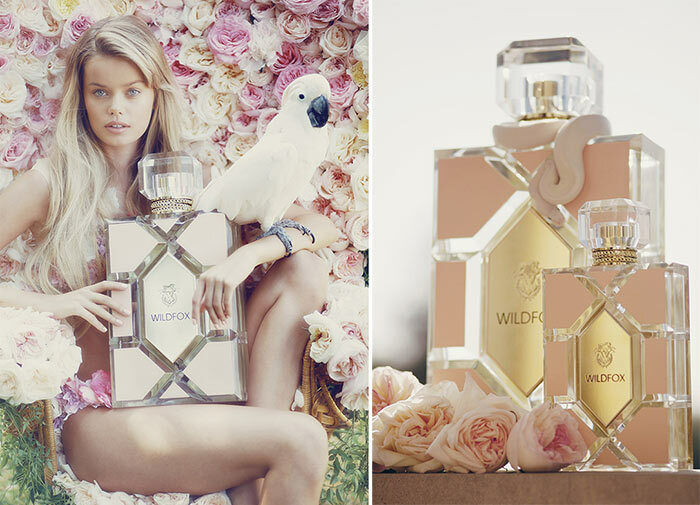 The promo campaign for the debut Wildfox Couture perfume is outstandingly beautiful. It’s so soft you want to touch your screen and play with those flowers on the model’s head. But we’ll come back to that. Let’s talk about the actual scent now, it’s in the floral category, but you’ve already guessed that from the photos, so let’s move forward. The top notes (that’s the first scent you feel after applying the perfume) are absinthe, incense, and apricot. Camellia, honeysuckle, and jasmine have taken over the middle notes, which is right after the first impression. According to Wildfox, their first fragrance is for the nature-lovers, those who might actually be walking with flowers in a park or street, and those who like to smell like a field of flowers. You want the exact wording? The scent is “for lovers, for skinny-dippers, for barefoot explorers and late-night chocolate eaters.’ For now, these three models are delivering this message successfully. But how did they do it? To me, the promo part is the most important aspect of this perfume. Look at the models once again and tell me it’s easy to get your eyes off of them. I knew you can’t. Being a person who can find criticism in everything, I’m having a hard time writing at least 1 bitter word about this product. And it’s not that I don’t see places where this perfume and the campaign could be improved. I wouldn’t even want to consider it after the photo slide. The stunning models dressed in flowers have thrown me into a completely new atmosphere, where the air is so light and soft, there are flowers everywhere and small bit of a scent can give you sensations you’ve never felt before. And that’s my point. The reason why Wildfox perfume will most probably be very popular is not the product itself, but the feeling it sells. Are you buying it? If yes, the fragrance is available from $70 to $80, which is a pretty good price for a perfume coming from a Couture company. Are you still short of summer tenderness after this review? Maybe there’s a small detail missing from your summer; get a nice and fresh scent, just like the Wildfox fragrance, and let us know what you think of it; we’d love to hear about your experience!